August Grenser of Dresden was a most prolific and versatile instrument maker. 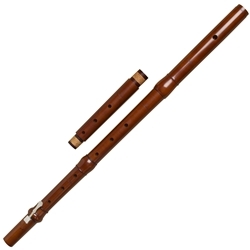 Originals are highly prized by performers and collectors all over the world, and the Nuremburg flute was used by Hans-Martin Linde for an outstanding recording. The original instrument in the Germanisches Nationalmuseum, Nuremberg, is made of boxwood with ivory rings, screw cap and register slide in the foot, and was supplied with seven different centerpieces from slightly lower than a=415 to about a=440. Our copy is made of European boxwood without decorative rings, foot register, or screw cap. It is available at either A=440 or A=415, or with an additional center joint, and plays well at both pitches.